As we all know, I wanted to make eclairs last week. Very badly. But my conscience got the best of me for my first January post, and decided to make some healthy instead. So now, now that it is squarely in the middle of the month, and we have long forgotten about the holidays, and hopefully, the resolutions, and we have already fast forwarded to game–watching and chocolate–based foods, we can move on to French pastries. Please join me. I probably should have pointed out that these are extremely easy to make. Perhaps a little time intensive, but certainly nothing too difficult. This could be your new game food! Seriously, how popular would you be. Also, important to note: I preferred the smaller cream puffs, over eclairs. Mostly because they came out more hollow, allowing for more cream, and more goodness all around. They were also easier to eat. Alas, I will note – on the third day of eating these eclairs (still so fresh! ), I ate these by tearing the pastry, and dipping it, first, directly into the vanilla pastry cream, and then straight into the chocolate. Yes. That is just fine with me. That could be your new game food! Really, how helpful am I with all of these ideas. Preheat the oven to 400°. Line two baking sheets with parchment paper. In a medium saucepan, bring the water, butter, sugar and salt to a boil over moderate heat. Remove the pan from the heat. Add the flour and stir vigorously with a wooden spoon for about 2 minutes, until the dough comes together and a film forms on the bottom of the pan. Transfer the dough to a large bowl and beat at medium speed until slightly cooled, about 1 minute. Add the eggs, 1 at a time, beating well after each addition. Transfer the dough to a pastry bag fitted with a 1-inch round tip. Pipe twelve 5-inch-long logs onto a baking sheet. You can also do this with a ziplock bag, and just cut off the corner. 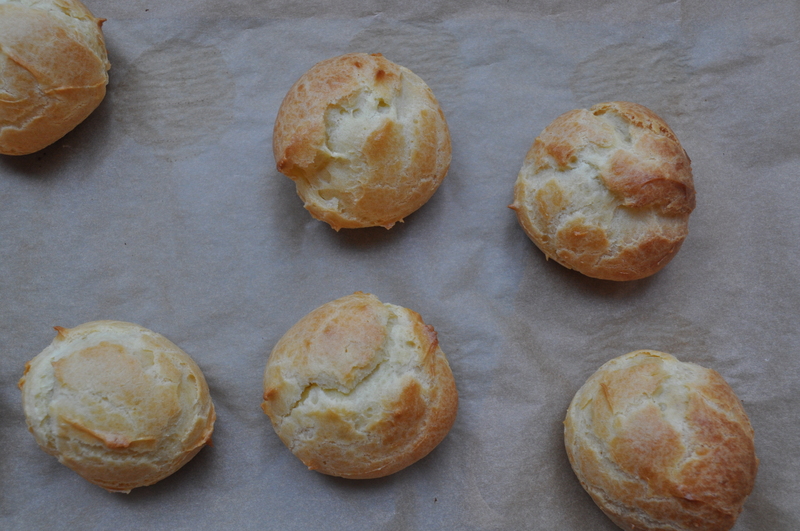 Or, you can scoop out tablespoon-fulls of the dough to make cream puffs. Bake for 15 minutes at 400 degrees. Turn the oven down to 325° and bake the shells for 30 minutes longer, or until golden brown. Transfer the baking sheets to a rack and let cool completely. In a medium saucepan, bring the milk, vanilla bean and seeds just to a boil. Meanwhile, in a large bowl, whisk the sugar with the cake flour and salt. Whisk in the egg and egg yolk. Slowly add the hot milk, whisking constantly. Pour the mixture back into the saucepan and bring to a boil over moderate heat, whisking constantly. Continue to boil the pastry cream, whisking constantly, until thick, about 30 seconds longer. Immediately strain the pastry cream through a fine sieve into a medium bowl. Cover with plastic wrap and refrigerate for at least 1 hour, or until cool. In a medium bowl, whip the heavy cream until soft peaks form. Whisk the pastry cream, then fold in the whipped cream into the chilled pastry cream until combined. Chop the chocolate and place in a heat-proof bowl. In a medium pot, heat cream for the chocolate glaze until scalded – do not let it come to a boil. Pour over the chocolate and let it sit for 1 minute. Stir to combine, until it’s thick and silky. 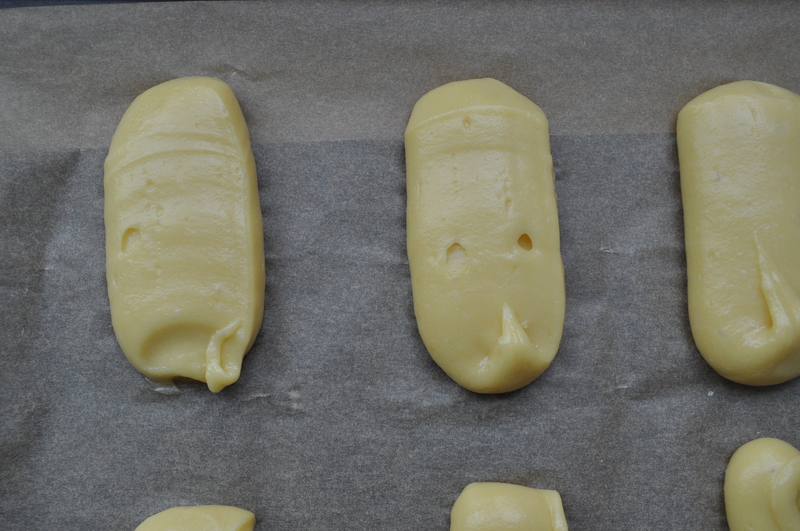 With a serrated knife, split the éclair shells lengthwise. Spoon a generous amount of the pastry cream into the bottom half of each shell. 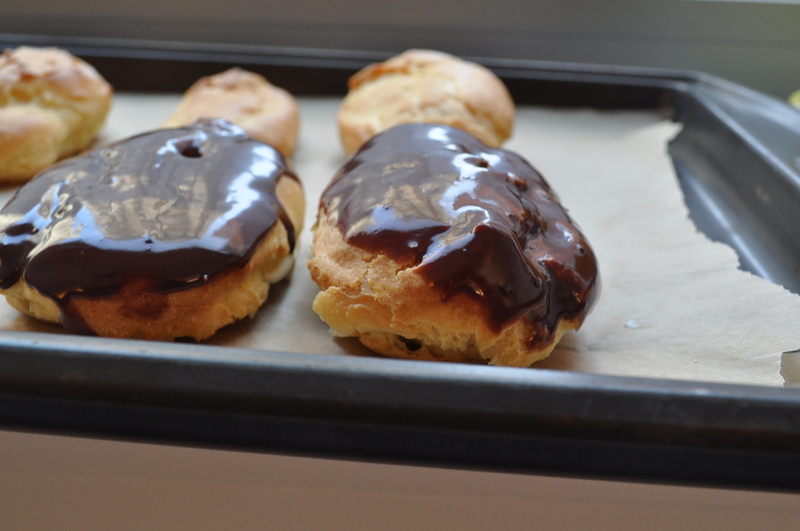 Dip the top half of each shell into the chocolate glaze, close the éclairs and serve. 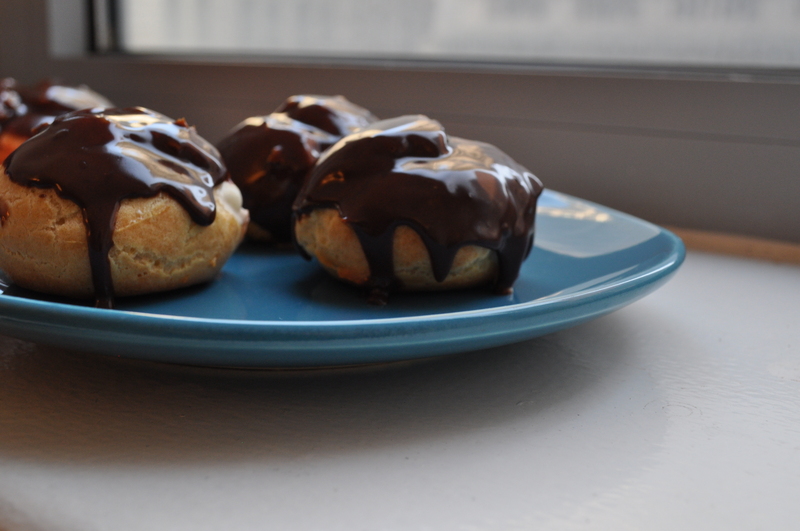 If making cream puffs, poke a hole into the side of the cream puff, and pipe in pastry cream. 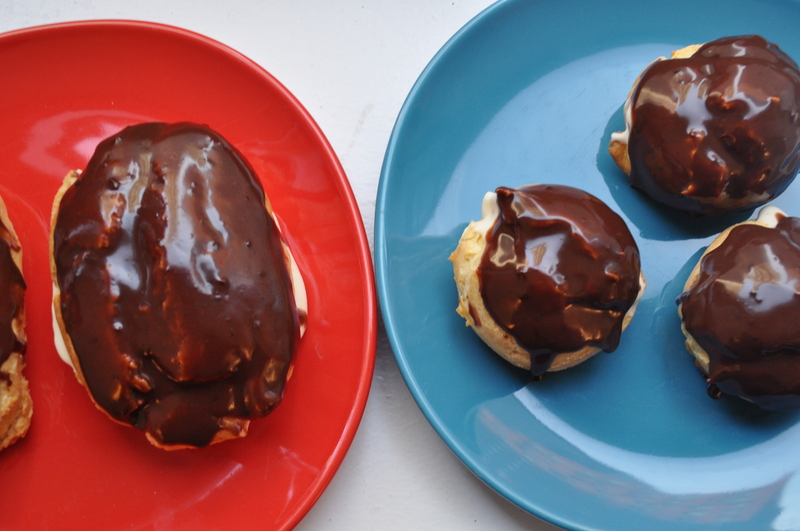 Dip the cream puff in chocolate. This entry was posted on	January 21, 2015 at 7:17 pm	and is filed under Uncategorized.